More on the 2006 Quad Dipsea here. 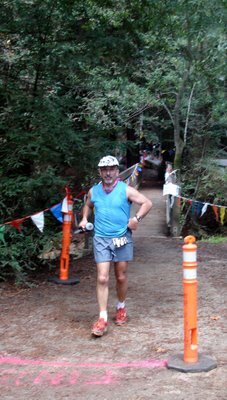 I saw you smiling and looking fresh all four laps, glad you enjoyed the Quad Dipsea. It's one of my favorites of the year. Great story and cool toy you have. Have you downloaded it to MotionBased.com? Cool site and graphs of your run. As "Squirrel" suggested, you should upload your race to MotionBased.com. I'm slightly biased since I founded MotionBased, but I think you'll like the service for analyzing and mapping your runs. 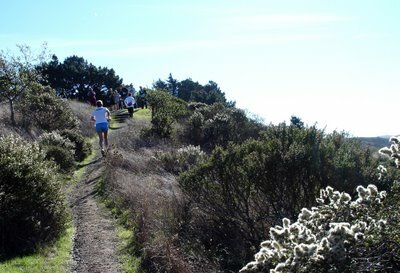 As a trail runner living in Marin, I'm out running the trails all of the time. 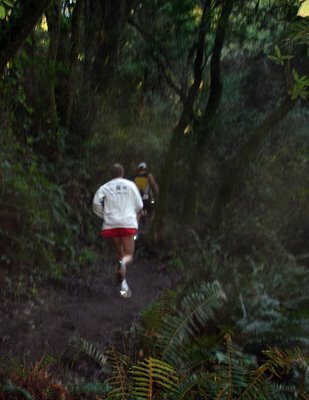 In fact, I'm starting to document my runs at www.marintrailruns.com. It's not complete, but you'll can get the gist of it. Again, congrats on the race this weekend. Scott- GREAT seeing you out there! My husband and daughter got some great shots of you- she will email them to you. Thanks for the hug- that was so nice! And that is me, in the first photo on your story on the Quad, with my tights and slipper on, talking to Buzz Higgins- trying to stay warm! GReat run! 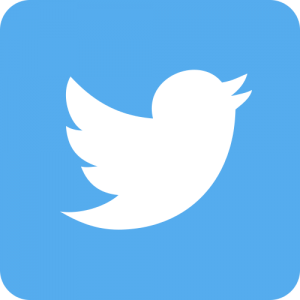 I've been a lurker on your blog for a long time now without getting as far as posting. 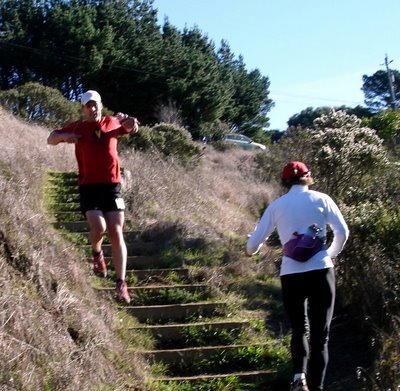 My longest race so far is a 29km trail race but I love to read all the crazy antics of the Ultra runners out there. You manage to bring a real "down to earth" feel to all of your race reports which makes for a very enjoyable read. Thanks to you I've found the wonderful zombierunners and the amazing Inov-8's, definitely the best brand of trail runner I've ever used. I talked with Santa and he says I stand a good chance of getting a Forerunner 305 for Christmas if I keep up my mileage. Motionbased looks to be an amazing website and concept. Can't wait to start charting my runs. 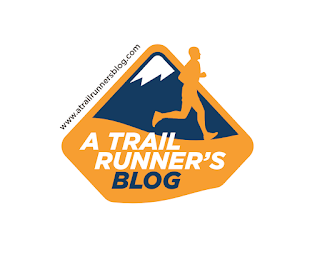 So, thanks again for all your work on the blog, I always look forward to your new posts and enjoy reading about all the crazy runners out there. Glad the Forerunner is working for you now. Motionbased is defintitely the way to go. Great report Scott! 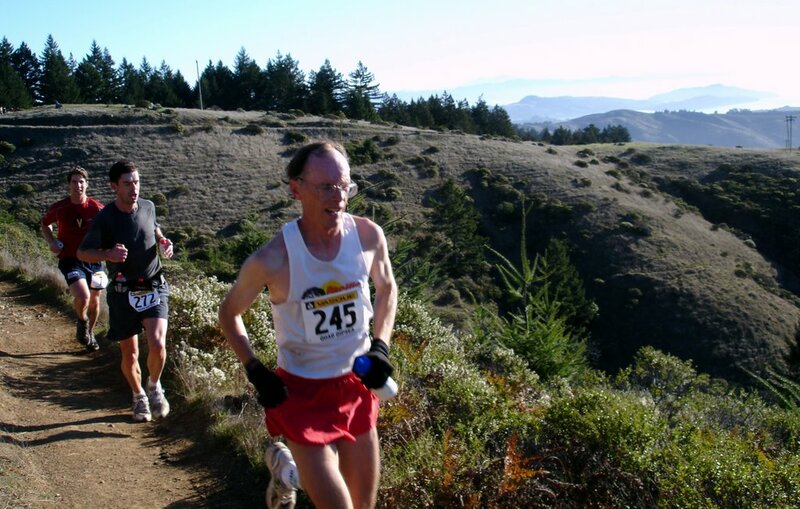 Makes me want to run this race just like your 9 Trails report made me want to run that race (which I did and loved!) Loved the pics too. You have the pics, and you have the GPS - you should post to Everytrail.com where you can map out your pictures along the trail path. It's cool. Jessica - nice work! 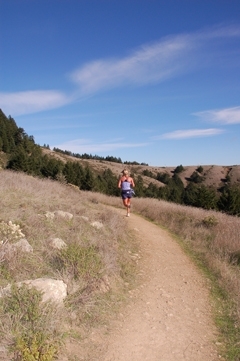 If you can tame that race, the Avalon 50m is well within reach. Congratulations. Thank you all for the suggestions about motionbased and everytrail - I will upload to them both shortly. And thanks to the Morejohns and Eric Gould for sending the pics! Great stuff. nice writeup, scott. i am amazed that you can remember all of the details. i tried to write up an acocunt of 9 Trails, but it reads like "there was a hill... then another hill.. then i was tired". as for the 305, i may have to break down and get one. my 205 only clocked about 28 miles of the 9 Trails race last weekend. Congrats on a great run! Let's make sure we meet next time our race calendars align. I'll make sure I get a pic of you on the trail! Thanks for stopping by, and congrats on SB9! That's a tough race. 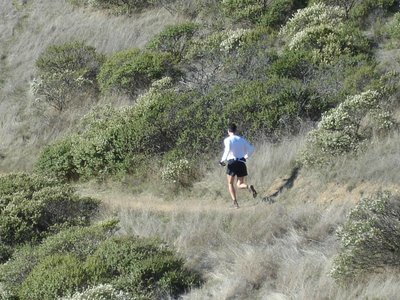 I hear you about having trouble finding words to describe a trail run (just look at some of my early entries...actually, don't look, it's too embarassing). It gets easier the more you do, since you recognize more faces and your readers get to know you better. I've found that people like the stories where I screw things up the most (joy!). Very weird about your shoes. You must have tough feet to break down shoes from the inside! Keep it up...hope to see you at one of these races! Whoa! You just have to add my name to all the compliments for the run and the report:) Awesome! 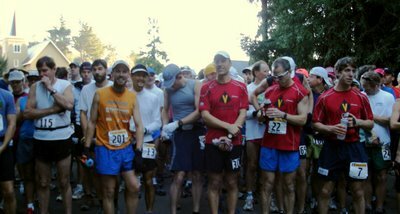 Awesome report of an awesome race. Nice work Scott. 9 Trails lost out not having you this weekend, sure am glad you were at Quad instead. Great pictures, great recap as usual. I've got that image of you, Sean and Mark Tanaka but I forgot your email. Send me a note at my addy if you want the mage. Thanks also to Rick for that last shot. 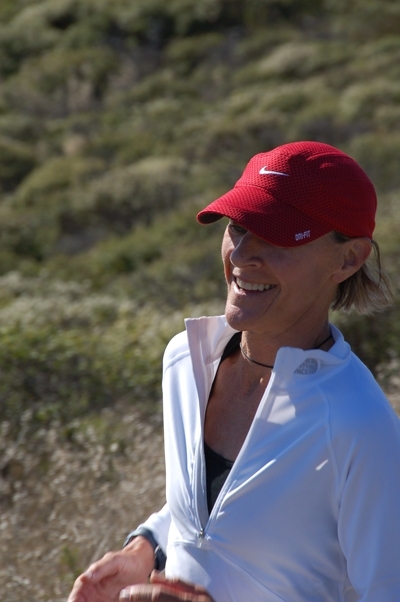 ...just curious about how many runners out there use a GPS - I am thinking of getting one for tracking distances, mainly? What do y'all think of them? Thanks for nice and live writeup! I was at Lake Tahoe with my family imagining this race, which I did last year. Glad to know lots of friends in the race, doing their best. I don't run fast and prefer to enjoy the trails. Therefore, I'm thinking about running with a camera even with the impression of "ethnic stereotype." 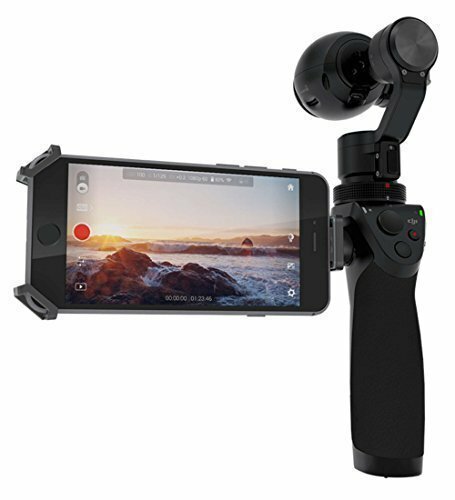 Wonder what camera do you have and recommend? 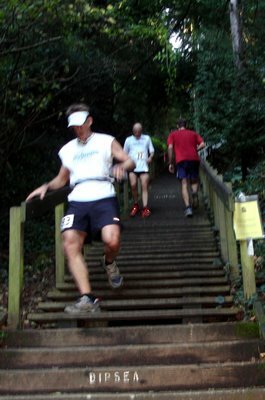 I'm pleased to know you wore Inov-8 315 in this run. I just got a pair of the same shoes. It looks excellent. 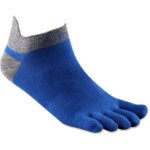 But, at the same size number, it is smaller than other brands such as Saucony, which I wear for years. I need to figure out how to exchange for one size more. Actually we did met at the TRT training run at the parking lot after the run. Anyhow I have enjoyed you blog, keep up the excellent work. BTW: Did you bee sting itch really bad for about three days? Mine did. If you like trails, you would love the Quad! I also see you're signed up for the Woodside 50k. The first aid station is in my driveway! If my flight gets in on time, I'll try and swing down and cheer you on. 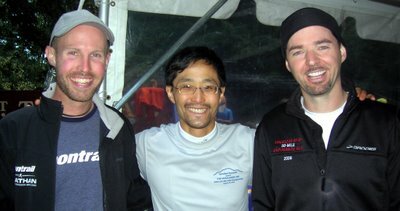 If REI won't take the Inov-8 exchange, just let me know and I can get you another pair (scottdunlap at yahoo.com). Damn right about those bee stings! They don't hurt much when they happen, but they itch for days (grrr). Great story and photos! 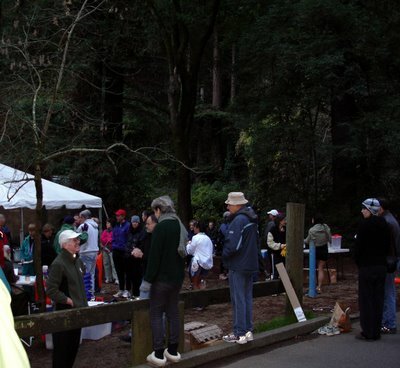 I linked to it from the Marin Saturday morning run website here http://satrun.songbirdsoftware.com. I hope that’s okay. Congrat’s on the 5:10. Absolutely! Sorry I couldn't get a pic of you in there too. You were too fast! Congrats on another amazing finish, Roy. Hi ... thanks for the awesome write up. I've really enjoyed your blog. I am training for my first ultra next year, and it is very inspiring to read the race reports and see the pictures. I appreciate you sharing this and the wonderful interviews with us!